I actually stayed up late last night (I’ve been averaging about 5–6 hours of sleep a night, not good) swatching a polish for today, but then in my morning stupor, I accidentally deleted the pictures. Hooray for me. It was Zoya Temperance, which is awesome so I have to reswatch it for you guys soon. But anyway, this morning, I decided to do something different. theBalm is not a brand I normally associate with nail polish—I think of blush and maybe eyeshadow. It’s also not a brand I run into very often, mostly since in Canada, the only brick-and-mortar retailer I know of is Rexall pharmacy, which until recently was not one I went to very often. (I’m a Shoppers Drug Mart girl, OK?) But in the last couple of years, Rexall have opened up bigger stores downtown that are more convenient for me to visit, so I’ve been popping in occasionally to check out the brands they carry that aren’t available at Shoppers. Some Rexall locations carry theBalm, and last week, I finally visited a location that had a display, at Queen & University in Toronto. Luckily, this display stocked around twelve to fifteen shades of theBalm’s Hot Ticket Nail Polish and they were about half off! Or perhaps not so luckily, since it probably means they’re getting rid of them. I picked one up last week for $4.96—they’re normally $10 (US and CA, for some reason)—then returned this week when Rexall was running a “Buy 2 Get 1 Free” sale on nail polish. So, I managed to get three more theBalm polishes for a tidy sum of $9.92! theBalm actually produces 31 shades of polish (not quite Baskin-Robbins) and unfortunately, the Rexall I went to mostly carried tame shades of red, pink, and brown. Gah! No pretty blues, yellows or greens. The names are on the wordier side, aren’t they? My initial impression of the polish in store was that…well, they just didn’t look like $10 polishes. The bottles reminded me of dollar store brands (particularly with the font and pinup girl printed on the front), and the formula looked on the thinner side when I tipped the bottles back and forth. The shimmer and glitter finishes didn’t blow my mind, either—but I am a major sucker for trying out new brands, so I went ahead and bought ’em. I mean, theBalm usually has super cute, retro-inspired packaging—so how come the polish is seemingly cheaply packaged? To be fair, the bottle itself is actually reasonably hefty, and the cap and brush are solid and function well. I’m really only talking about aesthetics, here. Anyway, if the polish performs well, I’m certainly not going to complain, especially since I picked these up pretty cheaply. Today, I swatched All You Ever Do Is Taupe. LOOK at it in the bottle. WHAT. IN. THE. WHAT. IS THIS? Well, I guess the name makes more sense this way. Don’t get me wrong—I actually really dig the way it looks on the nail. It’s a super smooth metallic frost in a light, smoky, lavender taupe. It doesn’t change in sunlight. But the bottle makes it seem that it was going to be a darker blue/green/purple color-shifter, doesn’t it? The formula is pretty good even if it seemed thin at first. A second coat applied smoothly and gave full opacity. This is definitely a better polish than its packaging suggests. Would I pay full price? Possibly not, but on sale, these are surely worth picking up. I may return for some creams, but the Rexall 3-for-2 sale ends tomorrow! 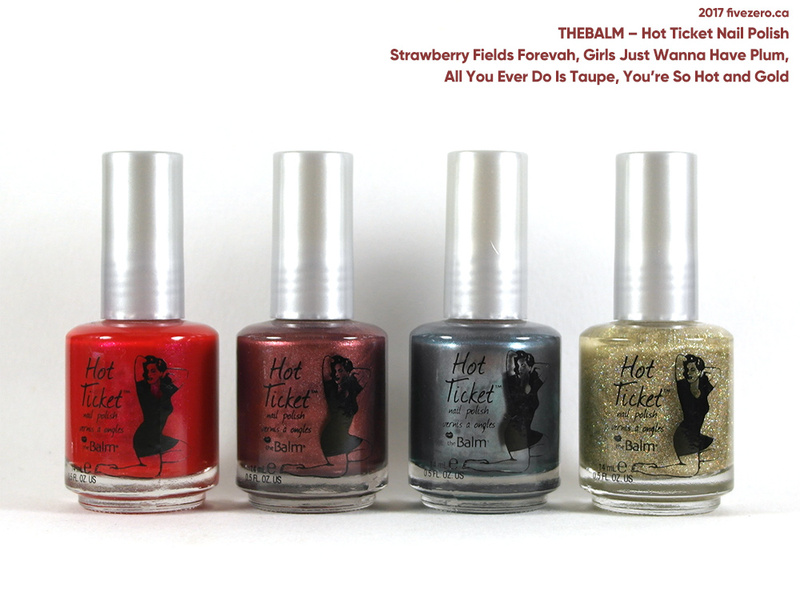 theBalm Hot Ticket Nail Polish contains 0.5 fl oz / 14 mL and retails for US$10 / CA$10 (yay!). The formula is free from toluene, formaldehyde, formaldehyde resin, camphor, and dibutyl phthalate (DBP). It is made in the USA. The company is cruelty-free. theBalm was launched by Marissa Shipman in 2004. The company is based in Alameda, CA, USA. Pretty color and love that they are cruelty free! Looks amazing! Is available online (I haven’t seen the brand before)? It is available online in the US (thebalm.com, and probably sold via other US retailers, too) but IDK about Canada. NailPolishCanada.com might have some but—ironically—not the polish! Oh boo on deleting the photos! Yup, I’ve spied theBalm nail polishes on clearance for many months now. None of the colours jumped out at me… but WHAT, this polish is so ugly in the bottle but pretty on the nails!!! I never bothered to look at the names in the display, I just went by the colours. And you didn’t TELL ME?! LOL. Obvs I rarely go to large Rexalls. The one by me is small and has like, occasional SinfulColors displays. theBalm should really repackage, though. Doesn’t fit with their aesthetic, IMO. And it doesn’t help that Rexall (at least the one I went to) only stocked “standard” colors. Did you find that a lot of the polishes had separated in the bottles? I know you can shake them up and they’re golden but I think it deters the average folk. Hmm, I think most of the polishes looked OK to me—not too separated. It is pretty funny that it turns off regular people who don’t necessarily know that it doesn’t mean it’s crazy old. 🙂 If I leave a brand new bottle on my desk for a couple of weeks, it separates. whoa it looks like you swatched a completely different polish! 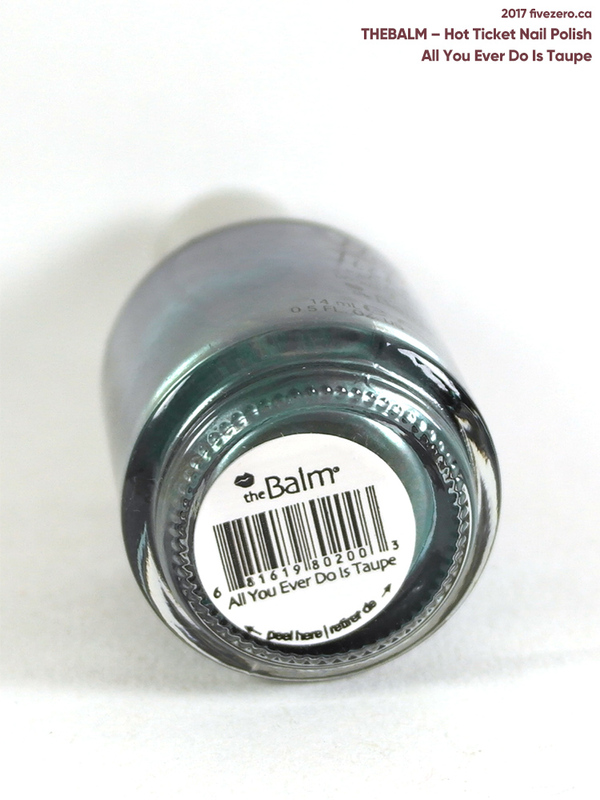 I’ve never seen the Balm polishes around here… yet. The packaging does look so cheap, dnw.